Please email Karen directly if you would like to schedule private lessons. Bring your sewing machine or use one of ours. 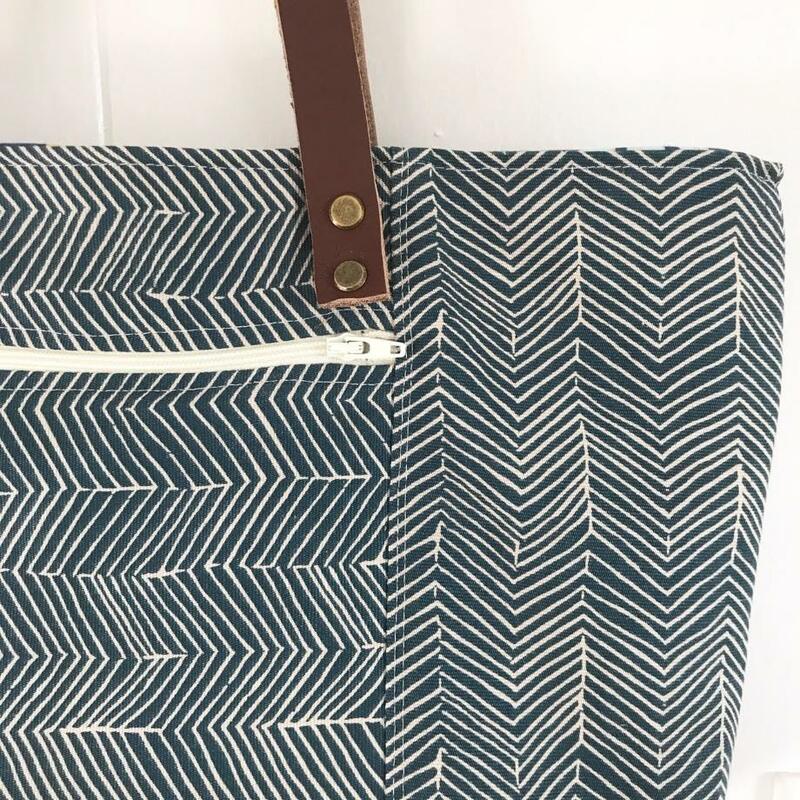 Sew your very own knitting project bag. 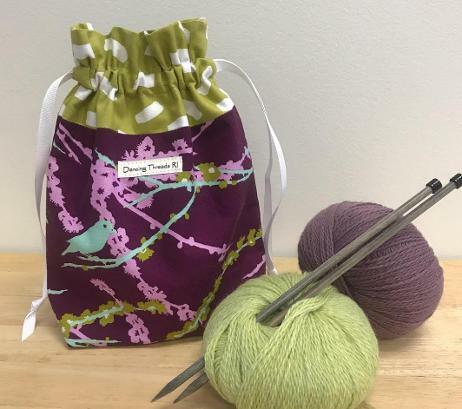 This lined drawstring pouch makes a beautiful, reusable gift bag as well. 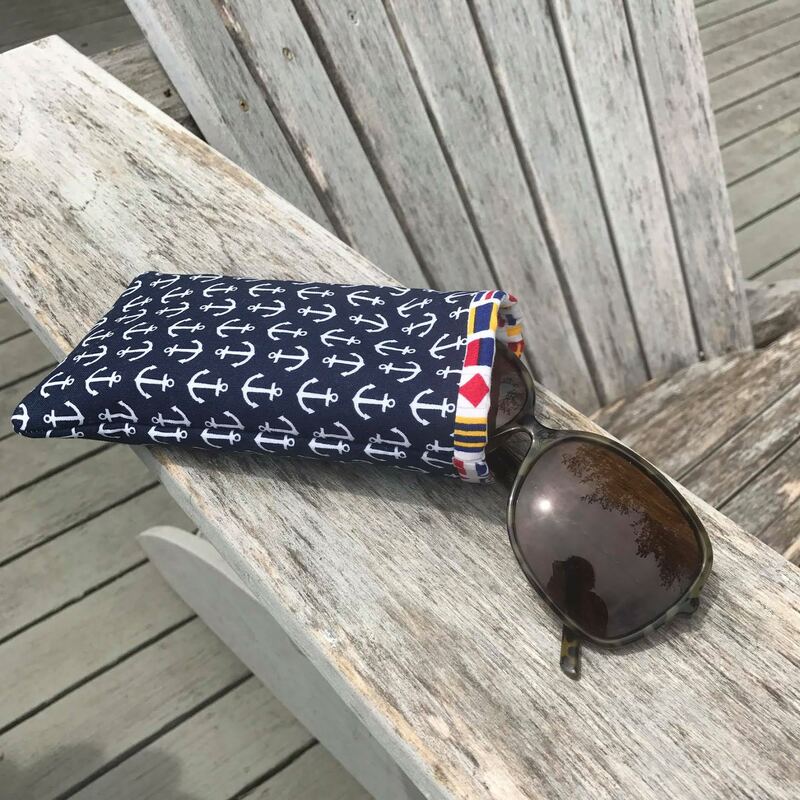 Bring your own fabric (1/2 yard of two coordinating woven fabrics--email me with questions), or I will have several options from which to choose. Beginner-friendly class. Create a lovely felt flower bouquet with three different types of flowers (chrysanthemum, rose and a wildflower). Intended as an opportunity for a parent/child, best friends, or other pair of crafty people to work together on a project. This makes a terrific Mother's Day bouquet. All materials are provided, all ages welcome. No experience necessary (very small amount of machine sewing required for one of the flowers). 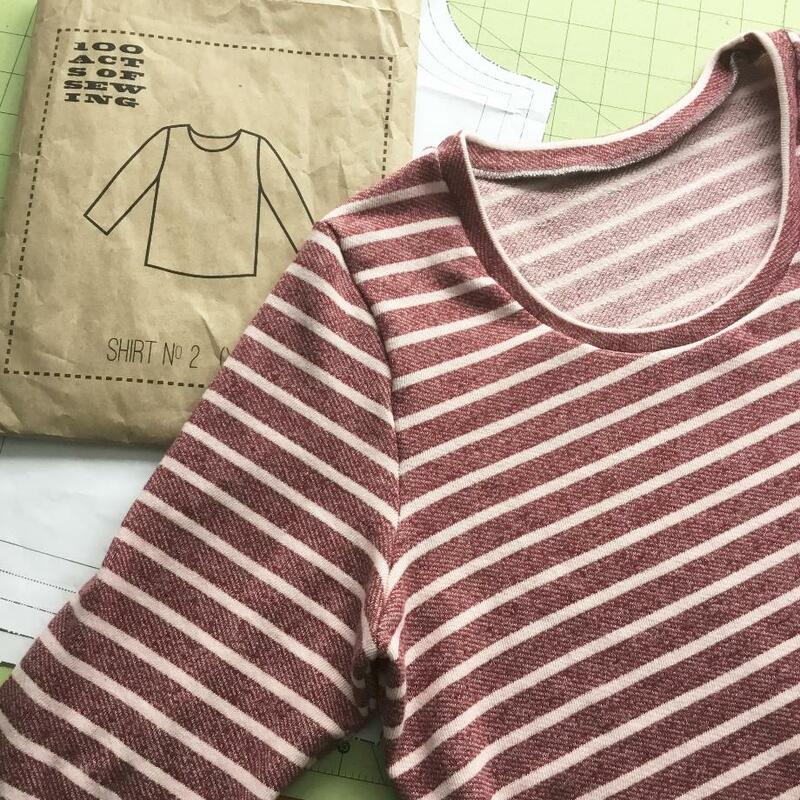 Make a wardrobe staple while learning the tricks to using a home sewing machine to sew stretchy knit fabric. A paper copy of the Shirt No. 2 pattern (sizes XS—4X) by 100 Acts of Sewing is included in the class tuition. Please bring 1.5-2 yards of prewashed medium weight knit fabric (email Karen with questions!). Make your favorite new handbag while learning how to work with leather and purse hardware. Handles, cream-colored zipper and all hardware is included in the course fee. Please bring 1 yard of home dec-weight fabric for the exterior of the bag (something heavier than quilting cotton), and 1 yard of quilting cotton for the lining. If you prefer, you may also bring a 7" zipper to match your fabric if you do not want to use the one provided. If you have questions about the materials, just ask! 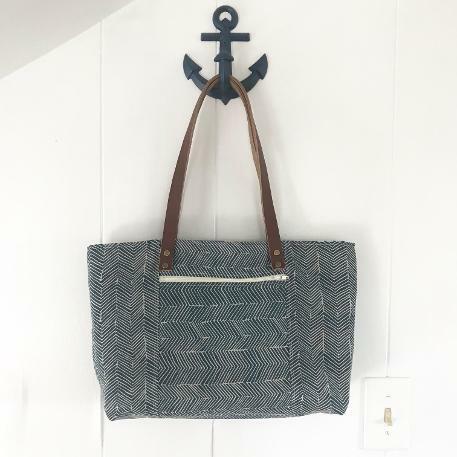 You will complete this bag in the 3 hour class, plus go home with a copy of the pattern written by Karen. If you've always wanted to make a quilt, aren't quite sure how to attach binding, or have never used a walking foot--this class is for you! 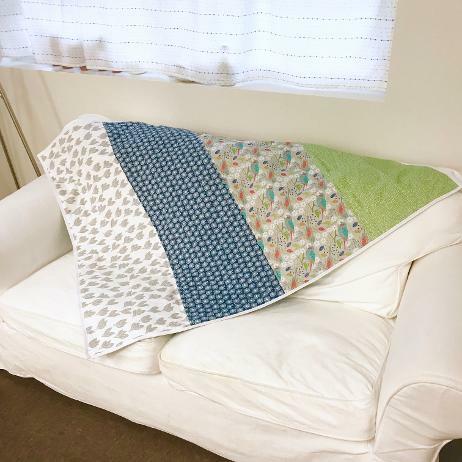 Make a throw-sized quilt, start to finish, in this single 3-hour class. We will prep fabrics with a rotary cutter and ruler, stitch together a very simple quilt top, use a walking foot on the studio machines to quilt the blanket, and learn two methods for attaching the binding. While most will complete this project within the 3 hour timeframe, there will be an option for scheduling a reduced-rate private lesson at another time to allow you to finish the quilt. No stress is involved in the making of this quilt! Contact Karen for a list of materials, or if you'd prefer to purchase a kit of supplies at the time of class. Machine Pre-requesite: Must have previously attended a Sewing 101 class. Please schedule one ($35 for a one-hour session scheduled at your convenience), or have a brief eval with Karen to demonstrate mastery of independent and safe sewing skills. Stitchery requires notification 24hrs prior to class start time if you cannot attend. Cancellations prior to 24hrs will be offered a full refund or store credit. No refunds can be offered on cancellations within 24hrs of class start time. This policy is for regular scheduled stitchery classes. Special events, guest and multi session workshops cancellation policies will be posted separately .